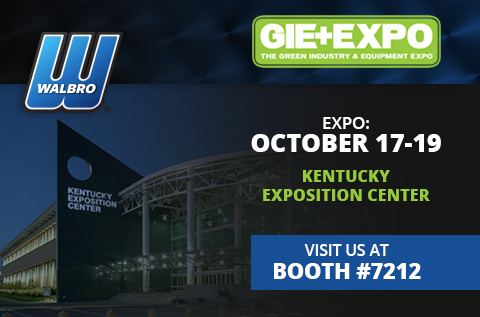 The Green Industry and Equipment Expo, GIE + Expo, is a major North American trade show for the outdoor power equipment industry. As the largest trade show for lawn and garden equipment, light construction, landscaping, and outdoor power equipment, this 20-acre three-day event, featuring 850+ exhibits, is where dealers come to learn what’s new in their industry. It will be held this year in Louisville, Kentucky, October 17 – 19. Walbro always enjoys exhibiting at this premier industry event, and this year we are arriving with some of its most innovative offerings of all time. This year Walbro will be showcasing several key products at booth 7212, including new applications for electronic fuel injection – generator. Also, on display will be the complete fuel system kit featuring a carburetor cleaner, scented fuel treatment, power equipment duster, and a spark plug. Be sure to stop by booth 7212 and enter to win a Walbro golf cart. We look forward to seeing you!